Publisher’s Description. In this book author Gregory Paul Johnson guides us in five significant areas-housing, food, technology, utilities, and transportation — teaching us how to create a simpler life, reducing stress in our own lives and harm to the environment. Due to the pressures and complexity of life today, simplicity is being sought after like never before. Put Your Life on a Diet offers the tools to escape the “cookie-cutter” existence so many are living today and find peace in a simpler lifestyle. Order A Copy. The book is available for purchase from Gibbs Smith, the publisher and also available through quality online vendors such as Amazon or Barnes & Noble. Or, better yet, ask you local bookstore to keep several copies in stock. The book is usually in-stock at Boarders, Barnes and Noble, and other bookstores. Shopping locally helps build up your local community both economically and socially. Help Spread the Word. If you’ve already enjoyed reading book and would like to help spread positive awareness about it, feel free to visit the Amazon page to rate it and leave a review, or to save time just click on any existing reviews that convey your sentiments. Online Discussion Forum. There is now an online community discussion forum on Ning moderated by the author where you can post comments and questions. Radio Interviews. Audio is now available for recent interviews with Gregory Johnson on ABC News Australia, Iowa Public Radio Book Reading/Interview, KRUU FM, National Radio in Ireland, and Public Radio Interview with Ben Kieffer from February 2007. Author Bio. Gregory Paul Johnson is the founder and Director of Resources for Life, an outreach and public interest organization based in Iowa City, Iowa. His study of Urban and Regional Planning with the Higher Education Consortium for Urban Affairs (HECUA) included travel to several South American countries including Panama, Colombia, Ecuador, and Peru. Today, as a technology consultant, Gregory works for the University of Iowa as well as clients served by his consulting firm, the Technology Services Resource Group. About the Publisher. Gibbs Smith Publisher has as their motto and mission statement, “To Enrich and Inspire Human Kind.” Their selection of books testifies to their effectiveness in reaching this goal, covering various topics such as energy conscientious sustainable design, gardening, green living, green-sustainable architecture, inspirational, notecards, outdoor recreation/survival, and vegetarian restaurant guides. In speaking about the publishing business, Gibbs M. Smith, Founder and President, had this to say, “I’ve always believed that publishing books is a privilege and a profession that everyone who works here appreciates and loves. I have always felt that the people who choose to work in the book industry self select that profession; to me it is more rewarding than any other form of work that I can imagine. We in the book industry deal with emotions, aesthetics, and human aspirations, and we convey this in a beautifully created package known as a book. We at Gibbs Smith, Publisher like to think that we handcraft each book.” Click here to learn more. Book Launch Video. Below is a video of the book launch. Search The Full Text. You can now search the full text of the book online at Amazon. Facebook Group. Join the Facebook group for Put Your Life on a Diet. Natural Home Magazine. 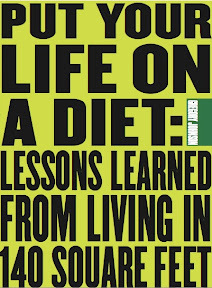 The November/December 2009 issue of Natural Home Magazine features an article about Gregory Johnson’s book Put Your Life on a Diet: Lessons Learned From Living in 140 Square Feet. Keynote Address Video. Below is a video from a April 2009 keynote address by Gregory Johnson about simple living. The Mobile Hermitage. Many readers have inquired about the small house, the Mobile Hermitage, that is mentioned in the book. Click here to learn more about the Mobile Hermitage. Media Coverage and Past Past Promotion Events. Below are a few of the media stories and events relating to the book and Gregory’s other simple living efforts. September 5, 2008 – Book Signing at Vortex Gifts in Iowa City. July 11, 2008 – The official launch of Put Your Life on a Diet is scheduled for 7:00 PM, Friday, July 11, 2008 at Prairie Lights Books in Iowa City. [More…] Visit the WSUI Live From Prairie Lights website for instruction on how to listen to the broadcast. The Mobile Hermitage will be on location for viewing. Amazon Book Description Discrepancy. In 2008, the book cover on Amazon indicated 150 square. This was an error. The actual dimensions of the home are 140 square feet (10 feet by 7 feet, two floors).